Anyone who tries out a few yoga classes soon realizes that styles can vary. A lot. Kundalini and ashtanga don’t even seem to be the same activity. Yet all types of yoga trace their way back to India and have some sort of common roots. Yogi Roots is a Portland nonprofit dedicated to unifying the local yoga scene. “The mission of Yogi Roots is to honor diverse traditions and bring all yogis together,” said Yogi Roots president Darlene Siegel. Which is just what they did Saturday at the second annual Yogi Roots Festival, held at the Bossa Nova Ballroom in Portland. This year’s theme was lineage. About 300 participants attended the all day festival, learning from teachers in nearly a dozen different traditions. Participants took asana classes from ashtanga, kundalini, Iyengar, Forrest, shadow, yin and Jivamukti teachers. They could also attend yoga philosophy lectures from teachers in the bhakti, Kashmir Shaivite and Ayurveda traditions, or chant and meditate their way through a Sivananda satsang. The festival was mind-expanding for many participants. One vinyasa practitioner stepped outside her comfort zone and was surprised how much she liked kundalini. In lecture sections, some people struggled with the disparate ideas about yoga practice and philosophy. They asked questions like is asana enough and do you need a guru. And, like so many things in life, it depends who you ask. 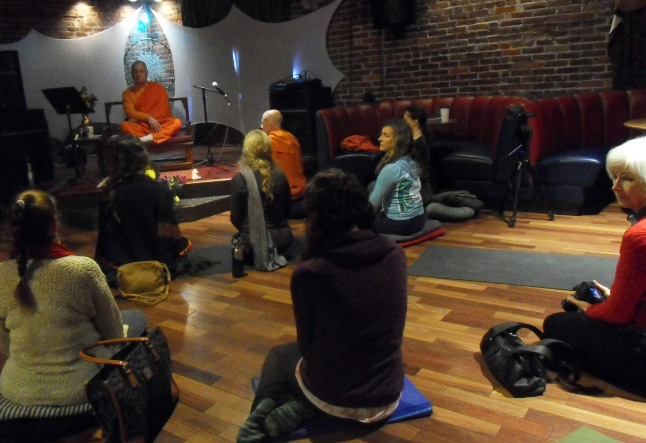 Matt Nelson, a bhakti yogi dedicated to Krishna, spoke openly about his path to bhakti after trying several other kinds of yoga first. He likened his search to drinking from different wells and noticing how the water tasted. “When I delved deep into the bhakti path, the water was very sweet,” he said. He also felt love at first sight when he met his guru. Swami Chetanandana, director of Portland’s Nityananda Institute, touched on some interesting reincarnation points during his talk on Kashmir Shaivism. If you thought people’s ordinary family-of-origin issues were bad enough, try combining them with reincarnation. “People reincarnate in the same family system,” he said, adding that your mother could someday be your grandchild, and your brother become your husband. “People make choices based upon the need to try to fill spaces that were unfilled by their parents. What we go searching for, we never find. There’s an endless cycle of disappointment present in every human.” When it dawns on people they could maybe change this, they take a spiritual path toward liberation. A panel of teachers from different traditions had mixed feelings about the importance of lineage. On the one hand, deep roots give a feeling of stability. But Americans sometimes confuse age with value, cautioned yogini Nandini Ranganathan, and tend to exoticize lineage. Music was a strong component of the Yogi Roots Festival. Karen Lerner taught her Jivamukti class while Portland musician East Forest sang, played keyboards mixed with sounds of frogs and crickets. Many sessions including short kirtans, with a long kirtan in the evening featuring Shantala. Popular Portland DJ Anjali and the Incredible Kid finished out the night with bhangra and Bollywood hits.